Last week the world learned of the official engagement of Prince William and Kate Middleton. The couple is planning to wed on April 29, 2011. 2010 Prince William Engagement Coin produced by the Pobjoy Mint. It is one of several commemorative coins world mints will produce to celebrate the engagement of Prince William and Kate Middleton. Prior to their royal wedding, at least three world Mints will celebrate their commitment with commemorative engagement coins. Announcing their intentions to produce commemorative pieces are the Royal Australian Mint and the two UK Mints: The Royal Mint and the Pobjoy Mint. The Pobjoy Mint has already unveiled engagement coins which depict an image of Buckingham Palace, the home of the British Royal Family, with a privy mark showing the initials ‘W&K’. 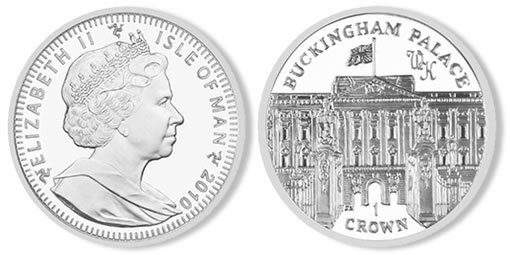 The commemorative will be available in cupro nickel and sterling silver and issued on behalf of the Isle of Man. As the UK’s official coin producer for 1,100 years, we can confirm that the Royal Mint is producing a commemorative Alderney £5 to celebrate the engagement of Prince William and Kate Middleton. In due course the approved image will be released. The Royal Australian Mint today welcomes the honor and responsibility to produce the official Australian coin celebrating the engagement of Prince William and Miss Catherine Middleton. As Australia’s official coin producer for 45 years and in keeping with our tradition of celebrating milestones of the Royal Family, the Royal Australian Mint can confirm that it is producing a commemorative coin to celebrate the engagement of Prince William and Miss Catherine Middleton. In due course the coin design and release date will be announced. Please let me know where I may purchase a set of coins. Thank You from FLorida!